Pachuca, formally kent as Pachuca de Soto, is the caipital o the Mexican state o Hidalgo. It is locatit in the sooth-central pairt o the state. 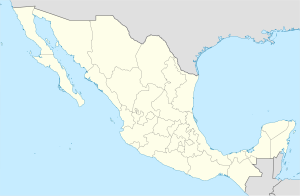 Pachuca de Soto is the name o the municipality o which the ceety serves as municipal seat. Pachuca is locatit aboot 90 km frae Mexico Ceety via Heich-gate 85. The ceety occupees a smaw glen an is amaist completely surroondit bi lairge hills, which are covered in hoosin an aw. The ceety centre haes maintained maist o its colonial-era structurs, wi narrae windin streets. Awa frae this centre is the mair modren Pachuca, wi warehooses, factories, supermercats an a lairge fitbaa stadium cried “El Huracán” (The Hurricane). The local team haes wan aicht naitional an internaitional titles here syne it wis built. The ceety proper haes a population (2005) o 267,751 which is 97% o the population o the municipality. 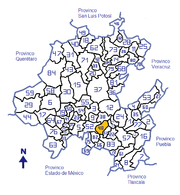 The Pachuca zona metropolitana (ZM) is ane o the 56 offeecially defined auries for the 2005 Census (2010 no released) consistin o the municipalities o Pachuca de Soto, Real del Monte, an Mineral de la Reforma for a total o 7 municipios, wi a combined population o 438,692 inhabitants as o 2005, up frae 375,022 in 2000, coverin 1202 km2. Pachuca wis declared the caipital o Hidalgo bi Benito Juárez in 1869. The ceety an municipality o Pachuca are nearly co-extensive, as the ceety grows tae cover juist aboot aw o the available open space. This haes eradicatit amaist aw o the municipality’s native flora an fauna. The municipality contains anerlie fifteen ither commonties accordin tae the 2005 INEGI census wi aw but twa haein less than less than 1500 fowk, an anerlie three percent o the municipality population o 275,578 lives ootside the ceety proper. The owerwhelmin majority o the residents are Catholic but the ceety haes a significant percentage o Protestants, mostly descendants o Inglis miners. The municipality is locatit on vera ruggit terrain wi varies in altitude atween 2,400 an 2,800 meters abuin sea level. It is locatit on the Trans-Mexican Volcanic Belt an the anerlie major flat aurie is whare the ceety center is. Twa notable peaks are the Cerro del Cuixi, the Cerro de San Cristóbal an the Cerro de Cubitos. Rivers that cross through here are the Actopan, the Amajac an the Tezontepec. The municipality has a territory f 195,30 km2 an borders the municipalities o Mineral del Chico, Mineral del Monte, Zempoala, Zapotlán de Juárez, Mineral de la Reforma, Epazoyucan an San Agustín Tlaxiaca. The climate is temperate an relatively cauld wi strang winds durin aicht tae nine months oot o the year. These can reach speeds o 60–65 km an oor. Wikimedia Commons haes media relatit tae Pachuca de Soto. ↑ 4.0 4.1 "Delimitación de las zonas metropolitanas de México 200" (PDF). CONAPO. Retrieved 2012-01-08. ↑ 5.0 5.1 "Principales resultados por localidad 2005 (ITER)". INEGI. Retrieved 2009-10-08. This page wis last eeditit on 10 Mairch 2018, at 22:38.